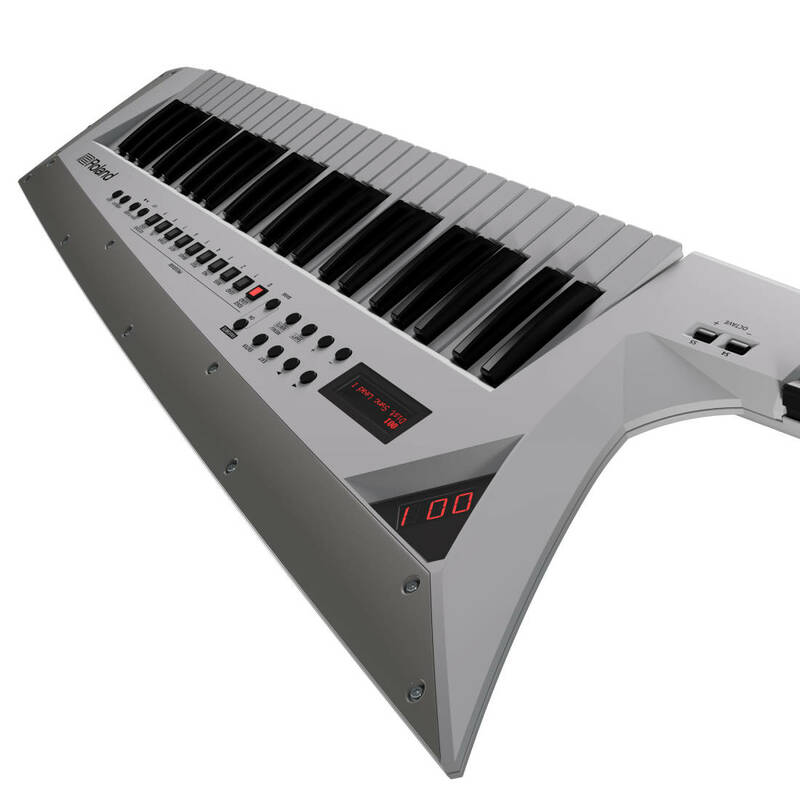 The AX-Edge is the ultimate performance synthesizer. It has a sleek, modern design and customizable look via interchangeable Edge Blades, 49 full-sized keys, and a sound set crafted specifically for keytarists. And throughout the AX-Edge, you'll find thoughtful design features that give you the freedom and confidence to truly express yourself on stage. Stage presence is everything, and you work hard to develop your image as a solo performer or band. The AX-Edge is designed to not only look stunning on stage, but also to match your own unique style. It's available in black or white, and each colour has individual design elements that make it stand out, like the "none-more-black" keys and removable Edge Blades. The AX-Edge comes with an extra Edge Blade in the box (a silver Edge Blade for the black model and a gold Edge Blade for the white) and you can even create your own original designs. Create a look that complements your band's style or swap out Edge Blades to keep things fresh. Dedicated buttons for favourite sounds give you instant access to edgy leads, big fat basses, and all manner of keyboard sounds perfect for the performing keytarist, whether it's taking a solo or sharing the limelight with your bandmates. If you like to customize your sounds, you can connect to the AX-Edge editor app with Bluetooth MIDI and tweak your sounds wirelessly. Splits and layers let you take full advantage of the expansive, full-sized keyboard. And a wealth of stunning new effects, including a master compressor and EQ, give you polished, studio-quality tone in any venue. And thanks to the Tone Remain function, you can switch sounds seamlessly on stage without notes or effect tails being cut off prematurely. The AX-Edge's neck controls are highly intuitive and truly take your performance to another level. While your right hand will appreciate the supremely playable keyboard, your left hand will love the modulation bar, pressure sensitive pitch ribbon, and easy-to-reach controls for portamento, hold, octave switch, and program change. If desired, many controls can be reassigned to functions that perfectly suit your performance style. The AX-Edge has thoughtful performance features that aid you in the heat of battle. An innovative dual display system keeps you in command at all times, while the onboard arpeggiator and song player can handle backing duties while you concentrate on slaying your audience. And the built-in vocoder, which can be layered with internal sounds, is just the thing for unique backing vocals or funky, retro lead parts. 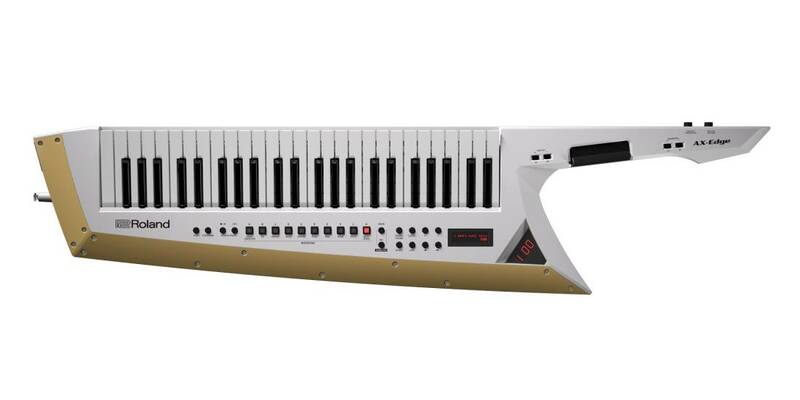 Description: Dustin Good from Roland Canada gives a quick demonstration and rundown of the new Roland AX-Edge Keytar synthesizer.